With like-for-like, five-year historical and five-year forecast data and commentary for 12 defined industry segments, the Outlook aims to make it easy to compare and contrast consumer and advertising spending across segments and territories. Based on consumer research from 2017 and early 2018, trust was a consistent theme when analysing consumer interactions with brands across all categories. 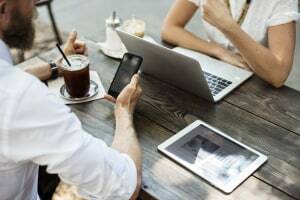 PwC Australia's entertainment and media industry leader Megan Brownlow told AdNews the reason behind the "trust deficit" between companies and consumers is due to CMOs focusing on short-term marketing goals, ignoring the bigger picture. "Brands haven't invested enough in longer-term metrics like brand health and are getting too addicted to short-term transaction metrics, such as click-through rates," she says. "Because there is so much data in that short-term end of the market, it's much harder to do a good job of measuring the top of the funnel." 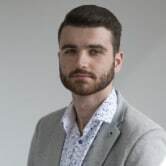 However, Brownlow says these attitudes are reflective of a broader corporate attitude that is placing too much pressure on marketers to achieve these goals, ultimately leading to shorter tenures. According to the report, numerous breaches of trust by corporates in Australia and globally over the last year has "soured" relationships with consumers. She says companies that get the consumer trust piece right will "take it to the bank and boost investor and regulator confidence". Brownlow points out that domestically there is a trend from "big bosses" not understanding this and not placing enough weight in the balance between brand and trust. She explains that right now, we have industries that consumers have always associated with trust go through major changes which has unsettled people. "We have one sector, being financial services, being closely examined for this very reason. Not to say they are alone either, yet brands now need to realise this is of greater importance than ever." To deal with the issue, PwC developed a new framework, focused on educating brands on redeveloping their trust assets, 'ACTS'. Brownlow says this is how brands will be assessed by consumers, through a "trust lens", and the higher brands are marked by customers on those four questions, the greater their trust assets. "Having the importance of trust being understood right through organisations will be one of the biggest hurdles brands and the like will have to overcome if they are to regain that from consumers," she says. "This goes to reputation and risk, which are very important considerations for all senior management including the CMOs." The report breaks out varying segments. 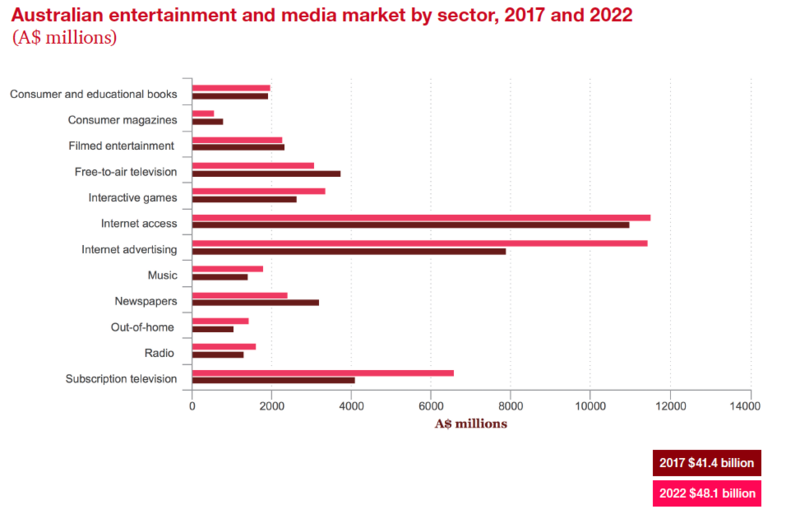 Australian entertainment and media companies must assess trust and create, capture and monetise their trust assets to grow over the next five years, according to the latest annual PwC Australian Entertainment and Media Outlook report. 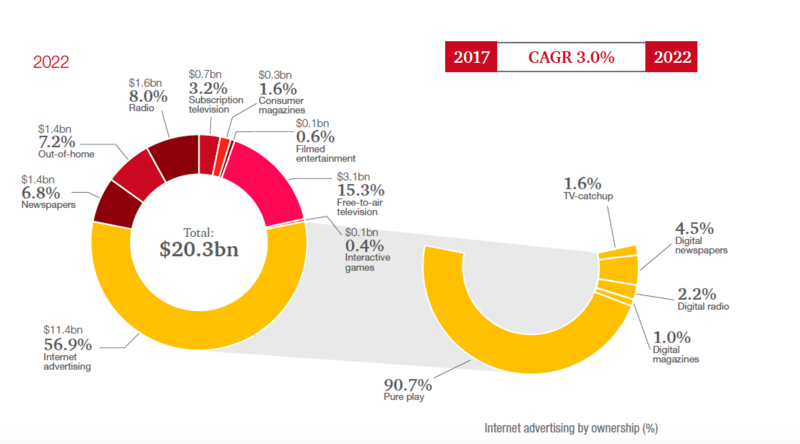 PwC’s 17th annual Outlook analyses trends and consumer and advertising spend across 12 segments. It shows spending is expected to rise at a compound annual growth rate (CAGR) of 3% over the next five years, but with sharp differences between industry segments and sectors. 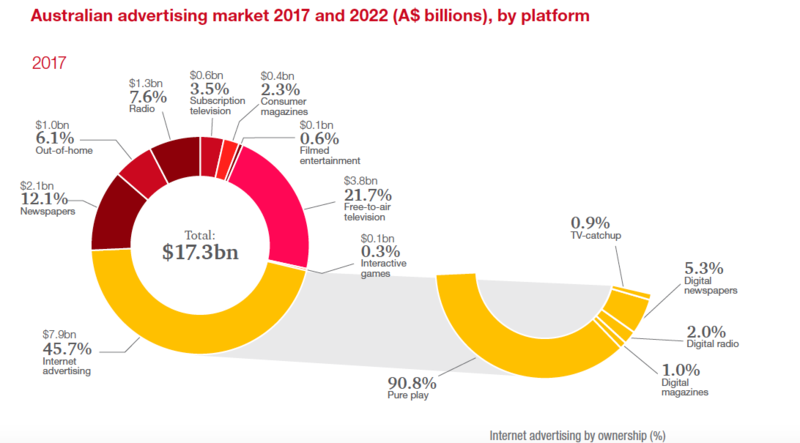 For example, it found the internet ad market is forecast to reach close to $12.7 billion (65% of the total advertising market) in 2022, and subscription TV market is the fastest growing segment in spending. See: Subscription TV market is fastest growing segment.